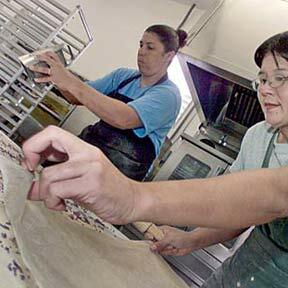 Shirley Filoteo and Natalie Higa prepare sweet potato lavosh at the Rainbow Falls Connection. The company, staffed by people who used to be on welfare, is one of the exhibitors at the Made in Hawaii Festival. The event runs Friday through Sunday at Blaisdell Center.